One of my favorite combos is represented here in the Fizzy Frozen Raspberry Peach Float, but feel free to forge ahead with the Fizzy Frozen Blackberry Lemon Float, Fizzy Frozen Mango Lime Float or any other Fizzy Frozen Float you can dream up with your local selection of sorbets and frozen fruit. And if you could ever possibly want more than that, sneak in a shot of whatever you got! Jen Cantin graduated from Clark University in 2011 with a degree in English and Journalism. She shares other (a)musings at Deep Fried Epiphany and dedicates this post to trying to explain drinking glass condensation to a 12-year-old after being six years removed from science class. It’s a truly difficult task. 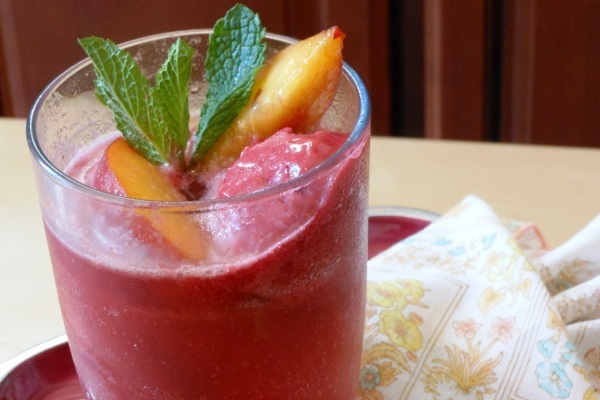 Place sorbet and peach slices into large glass. Fill glass to the top with soda or seltzer and alcohol, if using. Garnish with mint, if using. All participants: Enjoy, preferably with both spoon and straw. I beloved as much as you’ll obtain performed right here. The sketch is tasteful, your authored subject matter stylish. nonetheless, you command get got an nervousness over that you want be turning in the following. in poor health undoubtedly come further until now once more since exactly the same just about very regularly inside case you protect this increase.